Scarce French and Indian War Era Map showing French settlements in Pennsylvania. Carta Della Nuova Inghilterra Nuova Iork, e Pennsilvania. An uncommon 1763 Italian edition of Jacques Nicholas Bellin's 1763 map of the English Colonies from Pennsylvania to Maine. The map covers from Lake Erie and Lake Ontario south to the Potomac River and eastward to the Atlantic seaboard. The coastline is represented from Delaware Bay to the Penobscot River. The map identifies geographical features, various rivers, trading post, and fortifications. American Indian tribes are identified with curious Italianized names such as the 'Irocchesi.' The site of Niagara Falls is identified. This map was issued at the close of the French and Indian War, but features few updates over Bellin's original 1757 map of the same region. Curious French villages are identified just west of the Susquehanna River - evidence of the French intent to occupying western Pennsylvania that led to the French and Indian War. 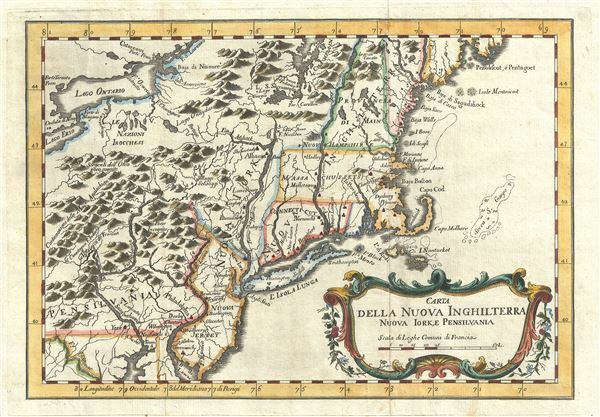 This map was most likely engraved by Andrea Scacciati and Giuseppe Pazzi for the 1763 Livorno issue of Il Gazzettiere Americano. Another marginally updated variant featuring an inset of Boston Harbor appeared in 1777 Atlante dell'America. The rococo title cartouche and distance scale are elegantly situated in the lower right quadrant. Coltellini, M., Il Gazzettiere Americano, Vol. 2, Livorno, 1763. Very good. Some minor marginal discoloration. Platemark visible. Blank on verso. New York Public Library, Map Division, Map Div. 01-5255.